The stickers arrived two days ago and I was finally able to pick them up today, they look amazing and I'm very impressed with the graphics team who patiently helped me with my design by sending multiple versions of my stickers for me to choose between. Every interaction was pleasant and it was obvious that Ozstickerprinting wanted to give me the best stickers for my buck, and I very much appreciate it. I spent some time thinking about any improvements that could be made and fortunately the only thing I could think of was that one of the stickers was slightly off centre. But it didn't affect the sticker, or cut at all. It was just the sticker was slightly off centre inside the square. But I don't think that really matters as I was trying to find something to critique to help you guys in future haha The shipping was fast, and the stickers were surprisingly glossy and look very professional! It's so amazing to see our small business logo in such a professional light. 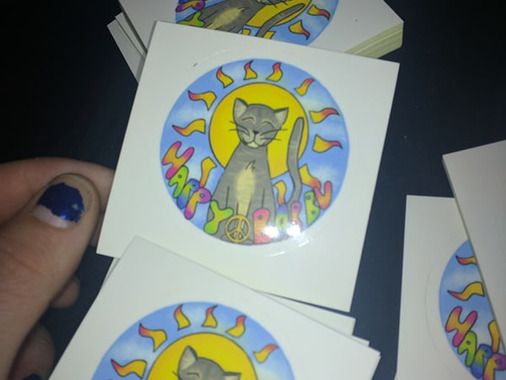 Thank you for conversing with me about the sticker design and helping us both get the best out come for our design, I'm very happy with the staff, the graphics team and the product (I'm pretty sure there's 1000 stickers but I'm not counting them any time soon so I'll trust your word haha) We'll definitely stock all our stickers from you in future as you are the cheapest and the friendliest with great quality stickers, can't wait to work with you again, thanks a bunch ??? ?